Chevrolet will unveil its new Orlando MPV at the Paris Motor Show in October where it will be one of four world premieres from Chevrolet at the show. The compact seven-seater promises a flexible interior and should be good value too with a high level of standard equipment. Set to arrive at UK showrooms early in 2011, the Orlando has quite a chunky look with the distinctive Chevrolet grille at the front complete with the bow-tie badge. It's based on the Chevrolet Cruze and uses similar engines. Under the bonnet, there's a choice of three fuel efficient engines: one petrol engine will be available, a 1.8 litre with power output of 141bhp and two diesel units, the latest version of Chevrolet's 2.0 litre engine with outputs of 131bhp or 163bhp. The interior promises plenty of family-friendly features such as a theatre style seating arrangement of the Orlando's three rows of seats, which means passengers get a better view forwards and to the side. The seats can be moved into a variety of configurations and Chevrolet claims it can be transformed into one of the most voluminous MPVs in the class when it comes to carrying loads. Elsewhere in the cabin there are a range of compartments of different shapes and sizes situated in the centre console, front and rear doors, rear cargo area and even the roof. There's even a cubby hidden behind the front fascia of the stereo, and within easy reach of the both the driver and passenger. Seen originally on the Orlando concept car, the designers have been able to integrate a usefully large area which is revealed by flipping up the face of the audio, and large enough for such items as an MP3 player, sunglasses and wallets. Within the space itself, there is also a USB port - ideal for re-charging the MP3 or iPod when on the move. Customers will also be able to choose from four trim levels in the UK with standard equipment on all cars including electronic stability control, six air-bags, air conditioning and electrically heated and adjustable door mirrors. There will also be a choice of 16-inch, 17-inch or 18-inch alloy wheels. The new Orlando MPV kicks off Chevrolet's ambitious seven-product launch program over the next 15 months. 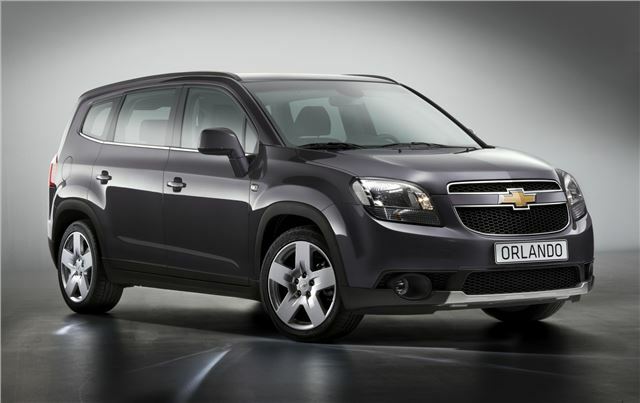 Full production of the Chevrolet Orlando starts in October with the car going on sale across Europe in early 2011.